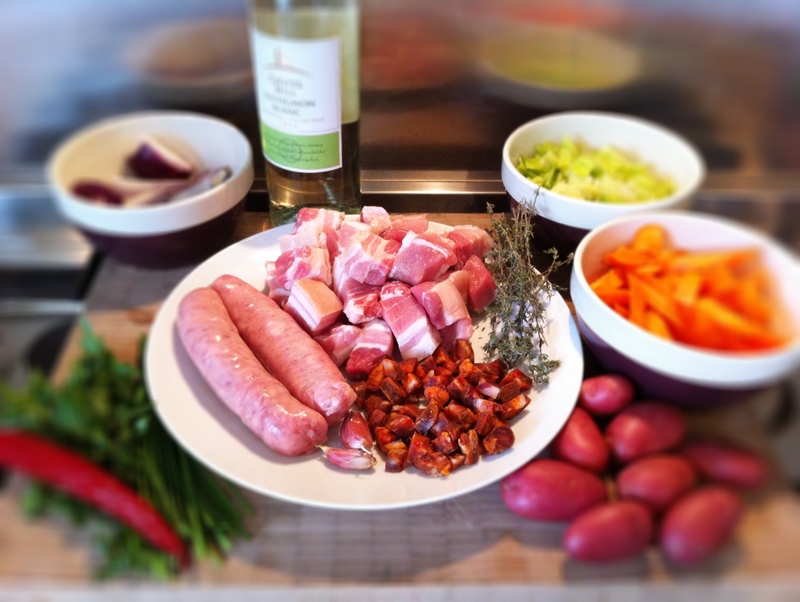 Three pork casserole featuring pork sausages, pork belly and chorizo. I’m still in a Spanish frame of mind after my recent trips to Spain. I was there two weeks ago but what some of you might not know is that I actually had to go back again last week for a couple of days. This last trip was for a different work project (but thankfully not another conference) and my colleagues and I were able to see a different part of Barcelona in the evenings, which was fab! Anyway, Spanish flavours are still very much on my mind so when I returned, I decided to make this casserole on Saturday night. Spring is finally arriving in the UK but on Saturday, it was still quite nippy so this casserole was both comforting and very satisfying. My husband’s not a huge fan of chorizo but he does like it in this dish. I’ve made it many times before but I’ve normally made this with chicken. 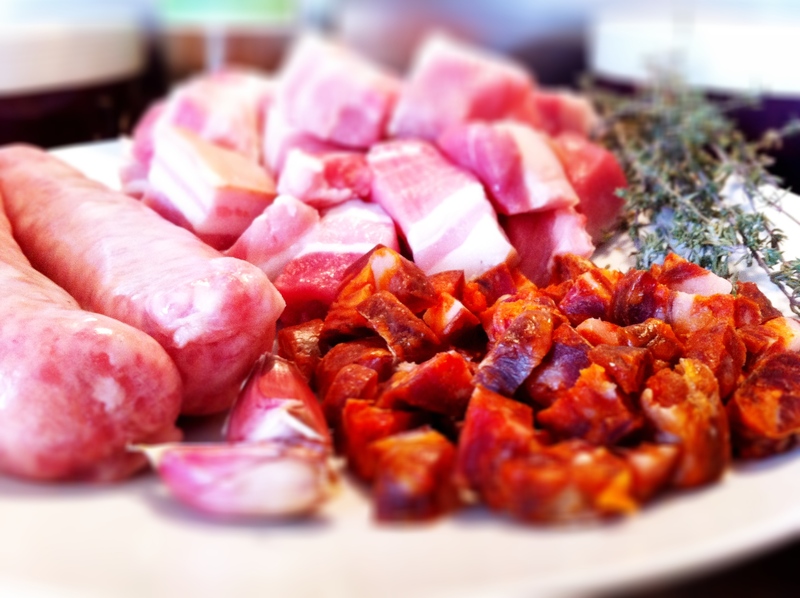 This time, I decide to make a pork version, three kinds of pork actually – in addition to the chorizo, I’ve used belly pork (cheap and cheerful) and some pork sausages. The chorizo is the star of this dish. What I didn’t expect was that all 3 meats meant that I created a lovely myriad of flavours but, more surprisingly, it enabled me to create a dish that also offered three different types of textures within one dish. 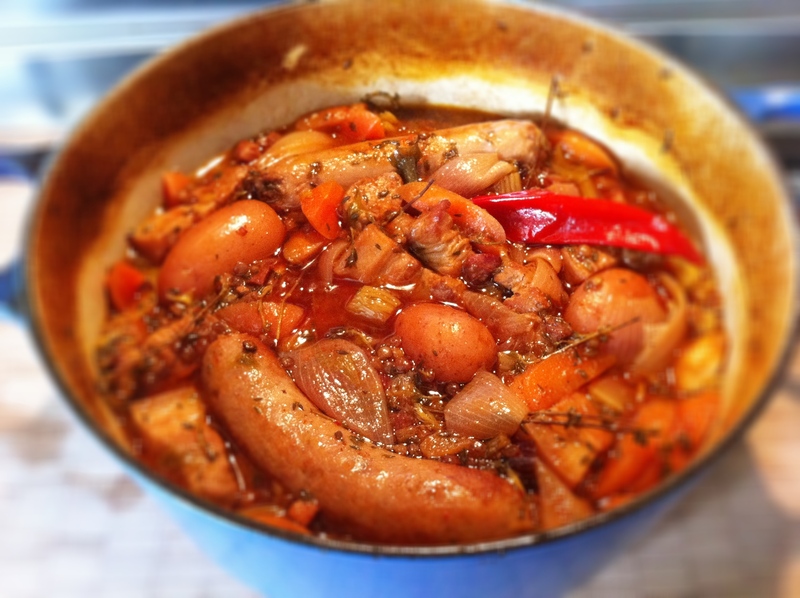 The pork sausages became meltingly soft, while the pork retained some of its texture, which again contrasted against the chopped chorizo, which had mellowed in flavour yet provided a more defined bite. I love puy lentils and it works so well in this dish. A word of warning though, this dish does require the use of a whole bottle of white wine. That might seem extravagant but trust me, it’s well worth it! 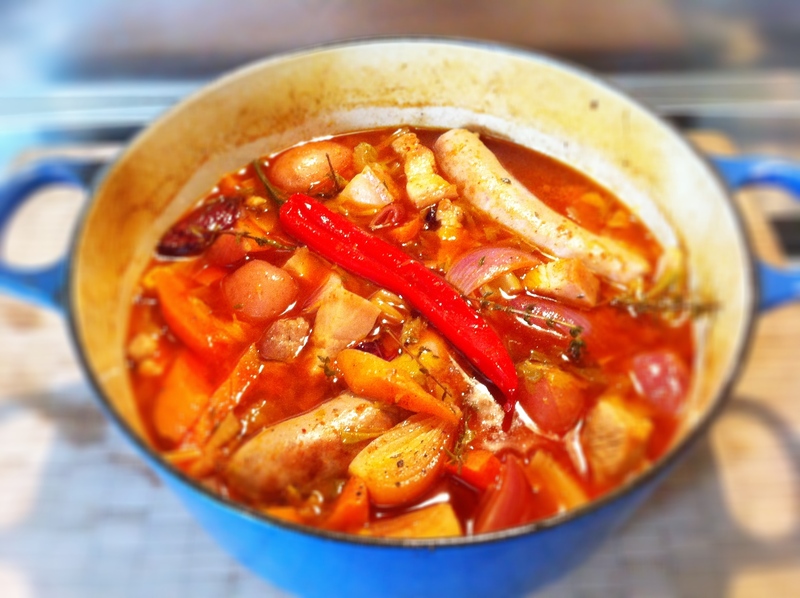 I love one pot cooking and this one is top of my favourite list because other than the 10 minutes it takes to prepare it, it’s the oven that does the rest of the work so I can sit back, relax and simply wait for the timer to ring. We eat this like a hearty stew and we love it ladled over a bed of plainly boiled spring greens or kale. You could eat it with a hunk of country bread too but I think the puy lentils provide all the bulk one needs for a rich, filling and warming supper. 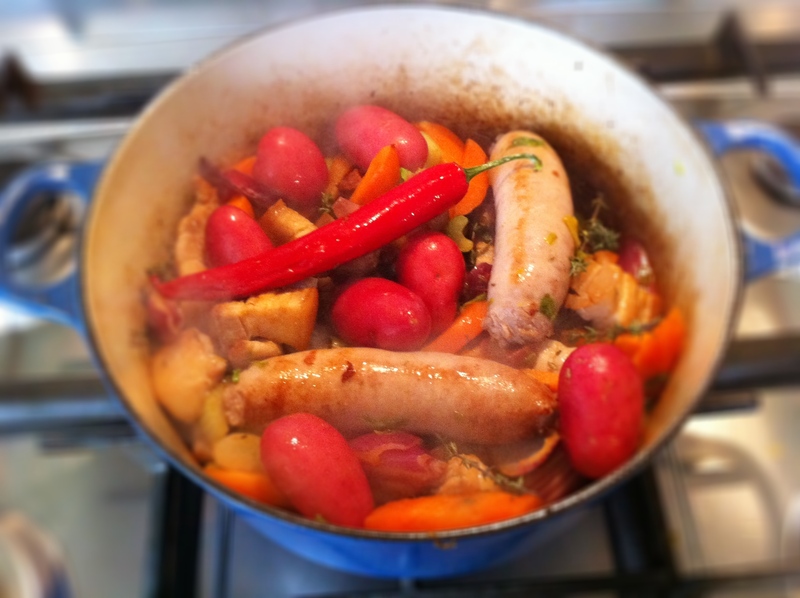 Then brown your chorizo and add your vegetables - it'll coat everything in lovely orangey-red hue. Add your browned meat back into the pan. Preheat your oven to 180 degrees Celsius. 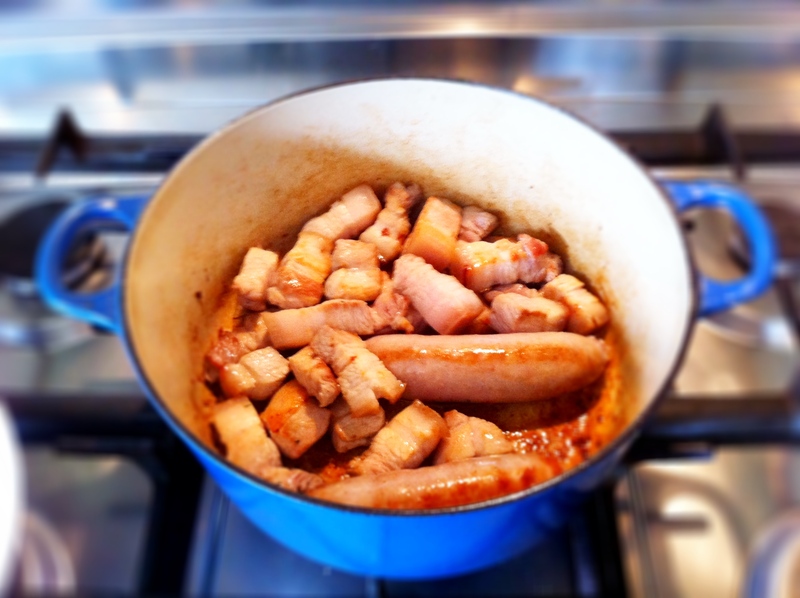 Meantime, In a large, heavy-bottomed casserole dish set on the hob on high, heat your oil and start by browning off your sausages and pork belly. Once browned, set them aside. In the same pan, fry the chopped chorizo for a couple of minutes – you’ll start seeing the chorizo release its oil. 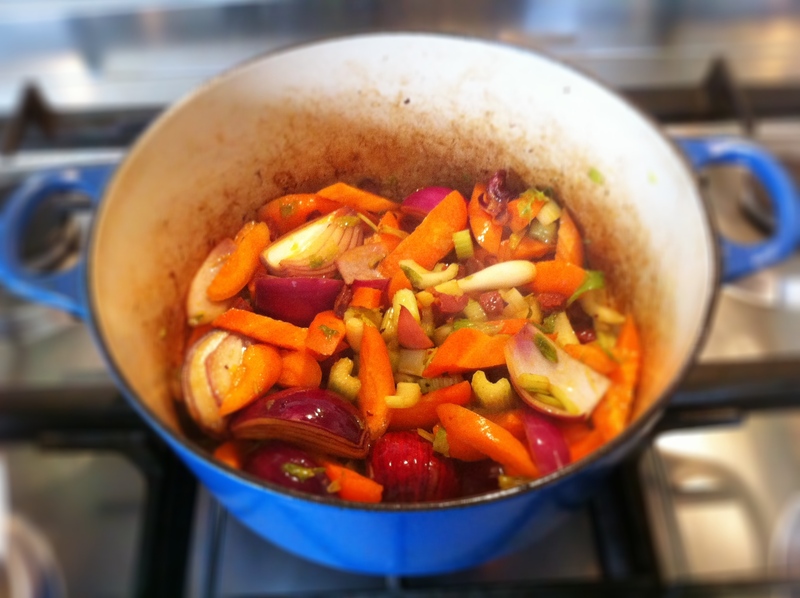 Add your chopped onions, celery, chilli and carrots and toss well. Add your browned pork back into the pan, and add your whole bottle of white wine, garlic, herbs, marmite, tomato puree and 2 cups of water to ensure all the meat is covered. Stir the bottom of the pan well to deglaze it. Drown everything in a WHOLE bottle of white wine. Add your dry spices and season with some salt and pepper. Pop your lid onto the casserole dish and transfer this into your oven to bake for 30minutes. Add your puy lentils, stir them in well and pop the casserole back into the oven for another 40-45 minutes, stirring once. Straight out of the oven and ready to be served. Before serving, taste and season with more salt/pepper as required. Ladle over steamed/lightly boiled spring greens (like boiled for no more than 3 mins max!) and garnish with fresh chives and parsley. 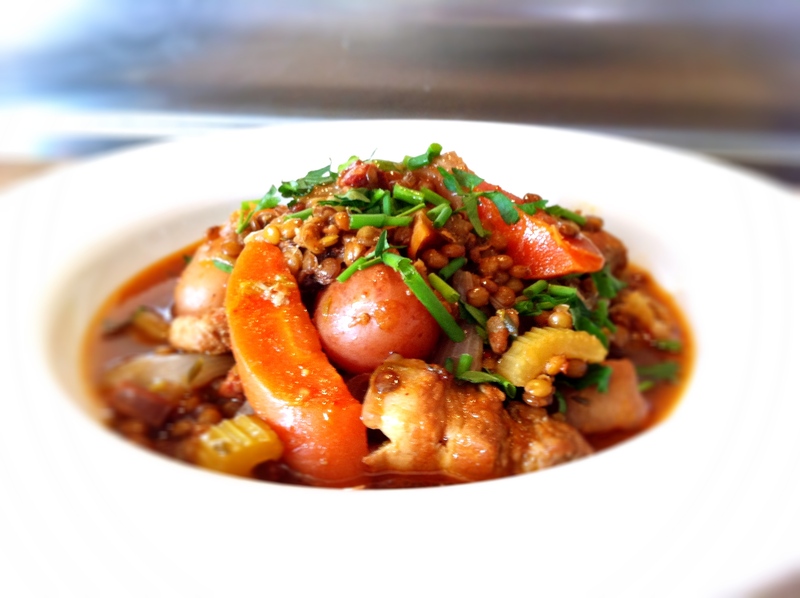 Three pork casserole with chorizo and puy lentils. Yeah, it felt a bit weird making a casserole when the daffodils had started poking their heads out, but it turned out to be the perfect mid season dish. Hi Bam, it’s actually really quite mild but flavourful. I only had a big red chilli and it wasn’t very hot. I’ve made hotter versions in the past and if you want to ramp up the chilli heat, I’d definitely suggest using hotter versions of chilli, and adding more chilli powder. I used my usual AOC chilli, which doesn’t have a lot of heat, but it has plenty of flavour and works so well with paprika. What, no bacon? This is a great dish and with that ingredient list, it must be very flavorful. I’ve a few friends that are going to love this. Thanks for sharing! LOL, now adding bacon would just be greedy! 🙂 It’s definitely a great party dinner dish because you don’t have to faff around with it and it looks after itself. It was really nice and the sauce is amazing. It keeps really well and as you can imagine, it’s even tastier the next day. This looks like it’s chock full of flavor – I’m sure it made for a delicious meal! Thanks Bill, it was really nice. I probably make this at least 2-3 times a year but in the past, I always used chicken legs and chorizo. This pork version really worked much better! What a perfect meal to bring in the chilly spring evening, BFN. I would totally love the flavours in this dish…I wonder if Bovril concentrated stock of some sort? Just add a lovely crusty bread and I’m in! Yes I actually added the bovril midway when I tasted it. I think this dish really needs it because I wasn’t making it with any pork bones in it. I think if I used chops, I probably won’t need as much bovril but I think when you cook only with the meat, it lacks a certain depth and that’s when concentrated stock really does help. 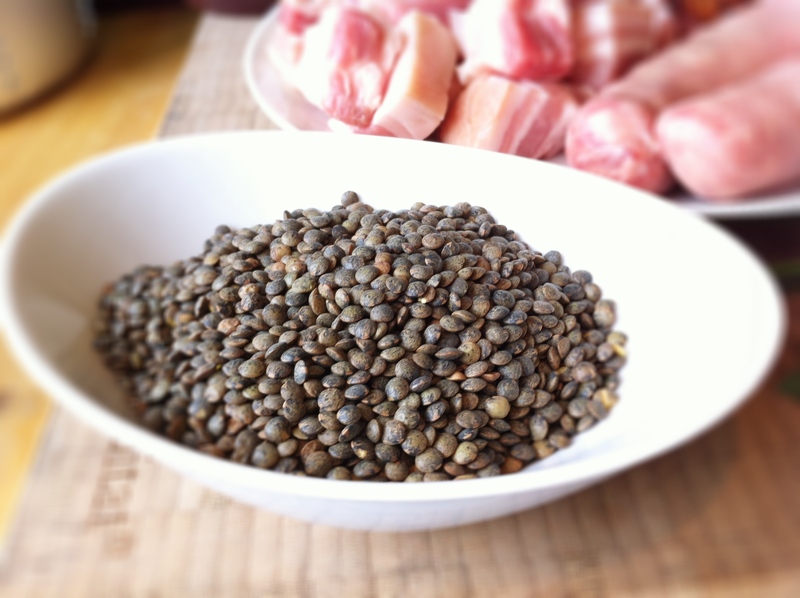 Now having seen these Puy lentils, they look really tasty and I’m going to have to try them! Great overall dish! Hey YC, you must! We never really ate it before apart from in Indian food and it’s been a real journey of discovery. This looks great, kind of like a lentil cassoulet! Hi, I didn’t think of it like that but I guess it is. Haha, thanks 🙂 Yes indeed. And I’m really glad this second trip meant I actually got to enjoy the real Barcelona and its dishes outside of a conference centre, phew! A really comforting and beautiful casserole. I love pork and I love lentils, so know I’d love this dish any time! We only started eating puy lentils in the last couple of years. I love it too! This sounds incredible! I must try it! I love everything about this dish including the whole bottle of wine in it! Yum! Thanks ZBD, I’m really with this new version using pork, and drowning food in alcohol has never failed me yet. LoL! Wowser this looks so good – I’m actually now hoping the sunny springlike weather wont last (temporarily) into the weekend so that I can try this, it feels like a perfect winter warmer! I was just thinking that – the sun is great, but we really need just one cold day to try this out!